It’s a uke that looks like a miniature guitar! This beautifully designed uke is highly playable - but you’ll need a pickup to maximise its potential. Superb woods, tones and tuners. No pickup, despite the hefty pricetag. 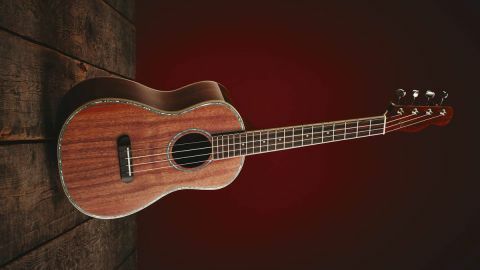 This Fender Montecito ukulele - a £210 koa-bodied tenor-sized uke made in Indonesia - is an unusual creature on first sight. Who is it aimed at? Dissatisfied ukulele players or guitarists looking to downsize? Perhaps both, we reckon, and the only way to find out if the Montecito delivers the goods to either demographic is to whip one out of its case and give it a whirl. The results are below, but before we get into it, let’s consider the pricetag. Two hundred quid and change is a lot of money for a ukulele in the golden age of cheap instruments in which we find ourselves. You could buy a perfectly decent full-sized acoustic guitar for that amount (titter ye not; we reviewed a £195 Gretsch, and it was excellent). We’ve tested a fair number of ukuleles, and they generally come in at under £150 for a pro-quality mass-produced instrument - and considerably less than that for the kind of uke that you buy just to mess around with in your home studio. What exactly do you get for £210, a funky guitar headstock aside? No disrespect to Gibson and the many other fine guitar companies out there, but Fender is the most recognisable axe brand of them all, at least in the electric world, thanks to their pioneering Stratocaster and Telecaster designs. Of those, the former was essentially an evolution of the latter, and it’s a Telecaster headstock which you can see on this ukulele. And why not? You can’t blame Fender for exploiting its back catalogue, and in our humble opinion this instrument looks all the better with a Tele head on it. A few Fender fans may be tempted to explore uke world as a result, which can only be a good thing. Purists won’t like it, but then, they never do. On reviewing any ukulele, whatever its design and pricetag, the first thing any of us should do is give the tuners a solid tweak. The instrument just doesn’t work unless they function solidly and without slipping. We’ve reviewed more than a few ukes (no names, no pack drill) with beautifully-designed and constructed bodies, but whose useless tuners make you want to chuck the damn thing out of a sixth-storey window. Life’s just too short to retune every five minutes. Fortunately, the Montecito’s ballistic properties will remain untested today, as the square-boxed tuners are tough and well-built, with no sign of detuning after a couple of heavy strums. Again, a certain number of uke traditionalists will dislike the electric-style aesthetic, but life would be boring if we all shared the same opinions, right? The top is this instrument’s main luxurious touch, with the bookmatched halves of koa wood seamlessly assembled on top of less glossy, unlaminated sides and a back of the same material. The overall effect is great; this uke looks like a serious contender simply by virtue of its timbers. The neck isn’t quite as fancy, made as it is from a relatively humdrum nato sandwich, but it feels very playable despite the slightly grippy finish. Fourteen accessible frets make the instrument’s range perfectly workable, and the solid, uncomplicated rosewood bridge with a bone nut rounds the Montecito off satisfactorily. Let’s get playing. The first impression you get on placing pick to string is that the action is very nice indeed - the first sign of a high-quality ukulele. Given the weeny scale of the instrument, and the mass of the neck versus the tension of the strings, action height has always been a failing in uke-land; however, the Montecito has no intonation issues that we can detect. On top of that, the string tension is friendly, with vibrato easy to achieve and a full response from each of the strings. Strumming chords is always the best way to reveal the full character of a uke, and although there’s no scratchplate and heavier picks may well score that lovely koa top, we suggest that big chords delivered with gusto is the territory where this instrument is most comfortable. The tone range is pretty reasonable for a ukulele, ranging from the boxy sound achieved by picking near the bridge to a much warmer tone if you pick over the soundhole or indeed over the fingerboard itself. As with most tenor ukes, the sweet spot is just behind the soundhole; focus your picking there for a balance between soft and hard tones. We’re pleased to report that there’s no obvious ‘Tupperware zone’; the dreaded point at which your uke sounds lifeless and plastic. Flatpicking and fingerpicking each have their place here, although the Montecito doesn’t offer bags of volume given that it doesn’t have a pickup (more on that below), so hang onto that plectrum just in case. The clarity of the tones at the top and in the mids is definitely among this uke’s strengths, and the strings ‘speak’ individually, again a sign of good design. Here’s a minor whinge. The Montecito doesn’t come with a pickup, despite its price point and the obviously ‘rock’ look that the headstock supplies. We can’t help but think that Fender has missed a trick here, as this uke is going to appeal to performers who want to play gigs that are bigger than a living-room. Sure, you could stand in front of a dedicated mic, risking feedback and volume spikes if you lean too far forward; an inbuilt pickup plus preamp, maybe with an EQ control, would prevent those issues and add massive value. We’ll readily admit that the Montecito is one of the most playable ukes we’ve come across, which is no surprise given its cost. Played in a small room with a tiny gathering of listeners, it might theoretically do its job without a pickup, but we wouldn’t bet on it. That’s our only negative point, though - as far as design, construction and tone go, very few ukuleles have outperformed this one in our recent tests. We really like the Montecito, but unfortunately the lack of stage-readiness lets it down slightly. Man, this ukulele is so perfectly set up for live performance - even the headstock looks ready for the stage! - and yet there’s no built-in pickup. If you invest in one, consider attaching one; we’ve just done a quick internet search and come up with a vast range of options. The range goes from a DIY piezo unit for £2 (yes, you read that right) which will undoubtedly break after 30 minutes of use, all the way up to a pickup more costly than the uke itself.